Time: 5:30 - 6:15 p.m.
Time: 5:15 - 6:15 p.m.
Time : 9:30 - 11:30 a.m.
We live in a time of technology, fast-paced, instant knowledge and anything we need know or want at the touch of a button or click of a mouse. Advances in technology over the last few decades has made it possible for all to have access to living a life of independence. Our students and children who have communication and or mobility challenges are able to use technology to aid in school, daily living and community involvement. Access to these tools and aids should also come with a conversation about how to safely use them and to be vigilant about the increased possible vulnerability and abuse. In conjunction with October being Bullying Awareness month, it is important to remember that bullying can take many forms and with growing technological advances, cyberbullying is a trend that we often see used to harm others, especially our children with disabilities. While technology provides opportunities for our children it does come with risk. Here are a few tips that can be used to create proactive solutions to support responsible use of technology. Never give out your email password, a photo, or any personal data, such as a physical description, phone number, or address. A person bullying could use that information to harass you in many ways. If you do discover that your child is experiencing cyberbullying, document it by printing the emails or web pages, saving electronic copies, and contacting your child’s school or the police. Every state is required to have a Family to Family Health Information Center. 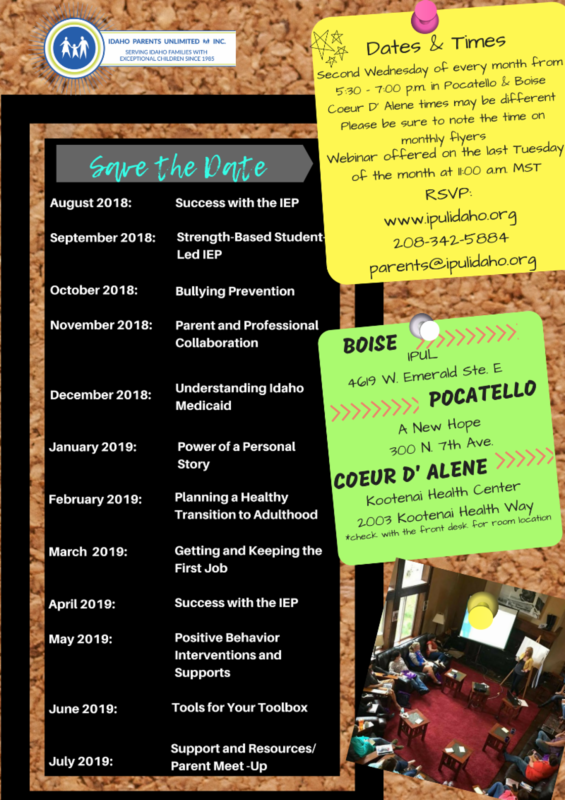 Here in our state, Idaho Parents Unlimited is the organization to house this program. The purpose of this program is to provide information, resources and technical assistance. 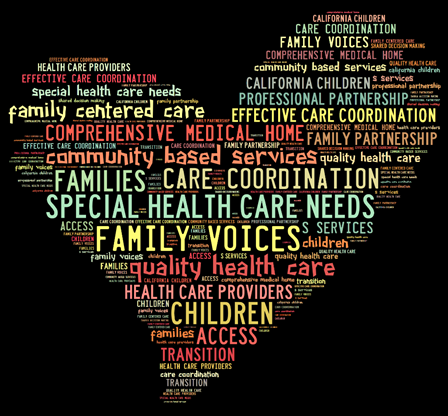 Idaho Parents Unlimited is recognized by Family Voices; a national family-lead organization, as the sole organization to house this incredible health resource for the State of Idaho. 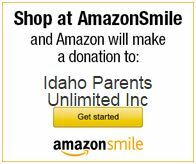 Idaho Parents Unlimited provides an array of information and resources on anything health related that is specific to children with special health care needs or a disability. When most people think about road construction, slow and delayed traffic often comes to mind. But for people with disabilities, this can create additional challenges and accessibility issues that may not be as apparent. For people who are visually impaired or have limited mobility, navigating sidewalks and crossing the street at road construction sites can involve a lot of pre-planning and coordination in order to navigate these obstacles safely. Furthermore, If construction signs, construction equipment and barriers are not properly placed, this can create additional challenges and safety concerns. 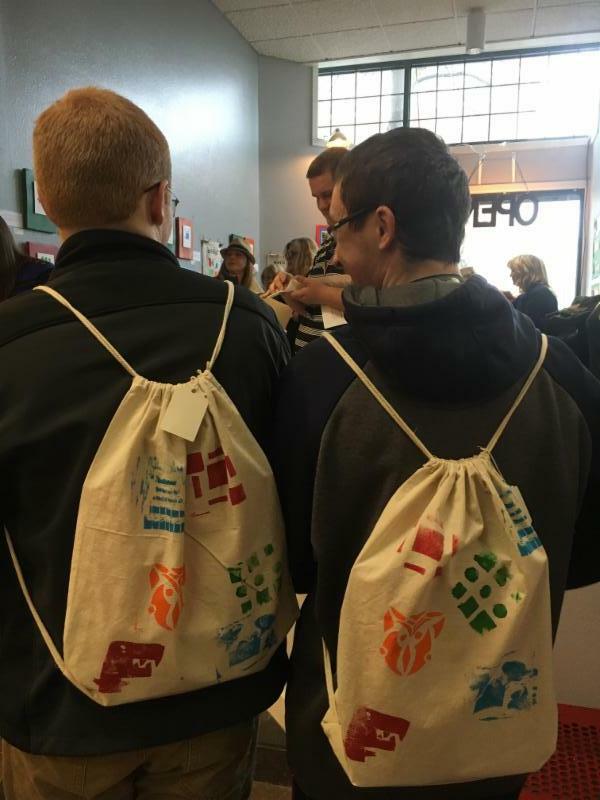 KTVB recently ran a story about someone who sometimes faces these challenges in order to raise awareness. 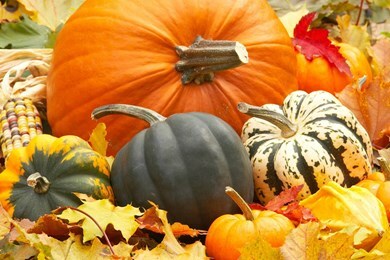 October is bullying prevention awareness month. 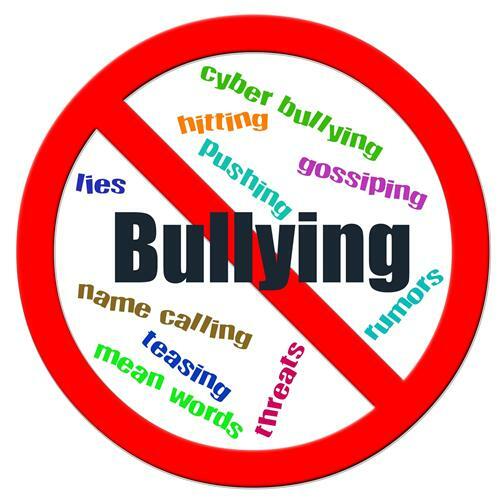 At Idaho Parents Unlimited we want to ensure youth understand the definition of bullying. 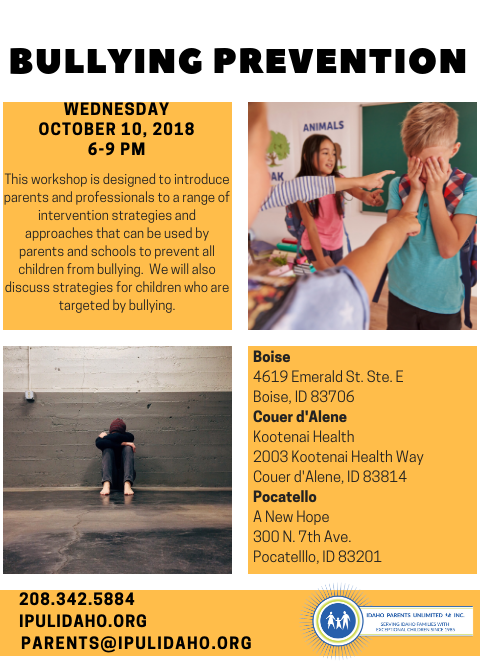 According to PACER’s National Bullying Prevention Center bullying is defined as: “An intentional behavior that hurts, harms, or humiliates a student, either physically or emotionally, and can happen while at school, in the community, or online. Those bullying often have more social or physical “power,” while those targeted have difficulty stopping the behavior. The behavior is typically repeated, though it can be a one-time incident.” No matter what the definition or the circumstances of the bullying are, it is important to know that bullying is never okay. What have you done when you have seen a peer getting bullied? There are steps you can take when you recognize a bullying situation taking place. These steps include being a friend to the victim of the bullying and notifying an adult of the situation. Please visit: https://www.stopbullying.gov/media/facts/index.html#definition to watch a video where five high school students read an adaptation of an essay written by a 14-year-old, who shares what it is like to experience bullying and to be misunderstood as he tries to figure life out. 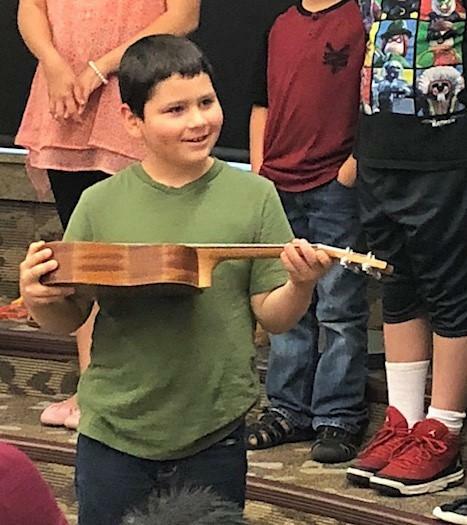 VSA Idaho's Creative Access programs have been placing teaching artists in public schools statewide for residencies in visual, performing and literary arts for 15 years. Residency sites include grades pre-K–12 as well as community centers. 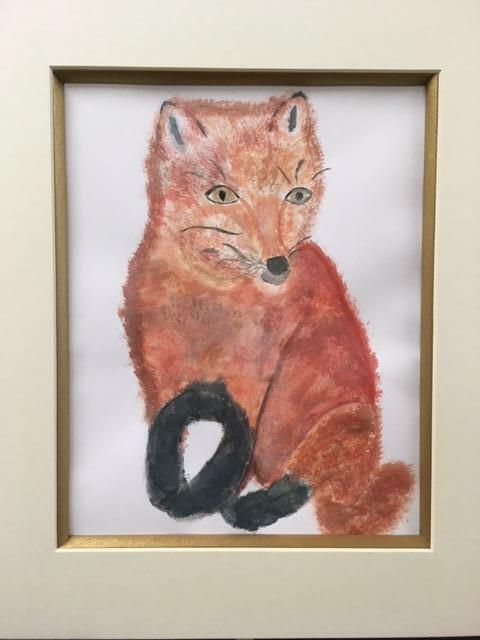 Residencies can occur in general or special education classroom and are tailored to meet the needs of students as well as accommodate teaching schedules. 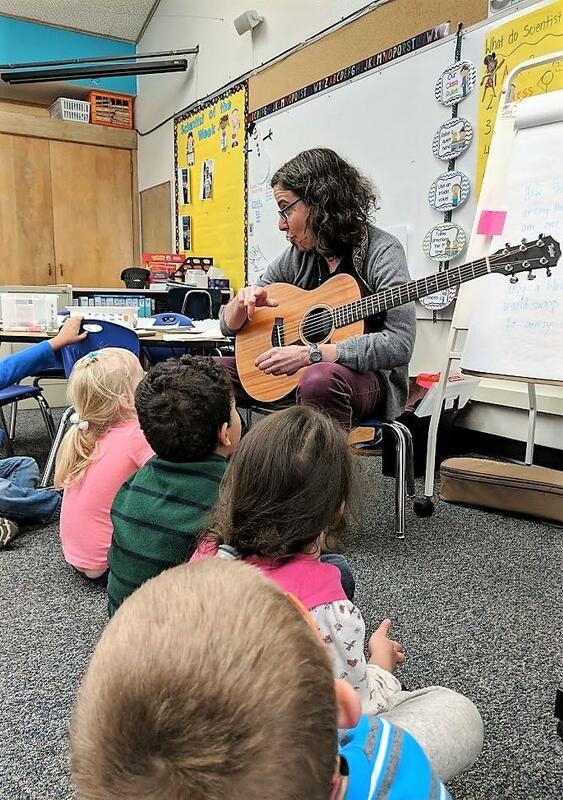 Residencies are provided annually throughout the state, and our teaching artists are all experienced in teaching arts with special populations.